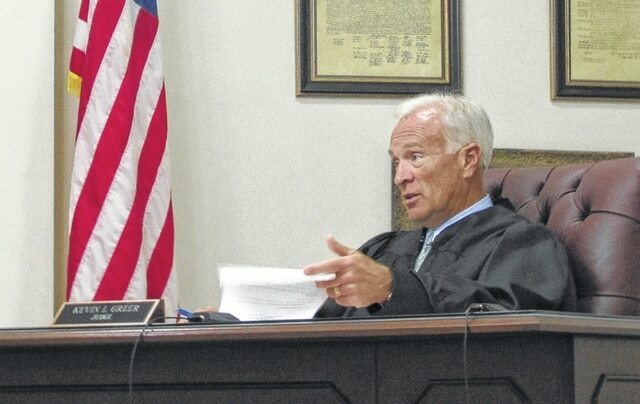 Highland County Juvenile Court Judge Kevin Greer is pictured during an emergency hearing in the court on Friday. A 2-year-old with injuries was placed in the temporary custody of Children Services on Friday by an emergency order of Highland County Juvenile Court. The complaint alleges that the child was taken to three different hospitals within the last two weeks. It says that on one visit the child had visible bruising and red marks on the face and neck. At the most recent hospital visit, a scan revealed the child to have bone fractures, some in various stages of healing. According to assistant prosecutor Molly Bolek, the toddler remains hospitalized. On Friday, the mother of the child did not object to the toddler being placed in the temporary custody of Children Services. Bolek said Children Services attempted to contact the child’s father to notify him of Friday’s hearing, but efforts were unsuccessful. The mother asked if she would be able to visit her child, but Judge Kevin Greer said that would be up to Children Services. When asked by the judge, she said that her boyfriend lived in the home with her and the child. The matter will come back before the court next month. In another hearing, a 13-year-old boy has been returned to the custody of his family following about a month in detention, and this week’s admittance to misdemeanor theft and a probation violation. The boy was previously found delinquent in an unruly case and appeared in the court in May after allegedly violating the terms of his probation by having contact with the victim in that case. Testimony was heard in that hearing from the victim’s mother, who described concerning behavior of the boy toward her child. She said she had concerns for the safety and well-being of her family. The boy was ordered to have no contact, whether direct or indirect, with the victim. He has a suspended commitment to detention and will be on community control indefinitely.